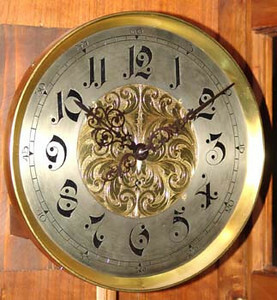 In the pictures below there are three different vienna regulator clock dials. The pictures on top are the "before" pictures and the picture on the bottom is the "after" picture that corresponds to the dial above it. Some of the finer Viennese regulators that we find have silvered chapter rings which look pretty horrendous when they have tarnished to a dark grey color. While it is possible to send these dials "out" for restoration, we have not been pleased with the results. In general the chapter rings come back in perfect condition, with none of the "life" or "age" one expects in an antique. Of course, there are also those instances where the restorer decides to sand the dial flat to make it easier to silver, thereby eliminating the finer engraved dial features. We generally do our own dial restoration work. For those who have not thought about metal dials, it is important to realize there are three general varieties of numbers and other art on dials. Some numbers are engraved into the chapter ring, then filled with black wax or black shellac. Then there are those which are drawn onto the chapter, and finally there are those which are on separate pieces of metal or porcelain (cartouche). Restoring a chapter ring usually requires some level of repair of the numbers - either touching up, or completely replacing. While we are able to re-blacken engraved dial features, we rely on a calligrapher, Frank Machera, to replace the dial art. We do the re-silvering ourselves. Hopefully this explains why we must quote prices for redoing dials on an individual basis. We have put this section together because we can only imagine how daunting it must be to look at a dark and dingy dial and believe it will ever be a thing of beauty. Hence the accompanying "before" and "after" photos.